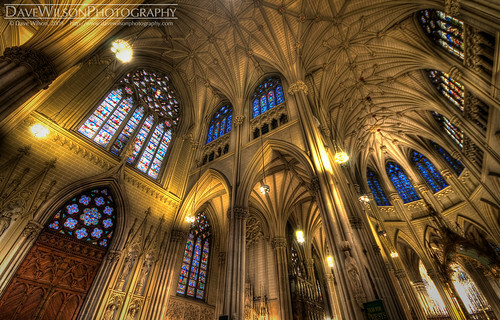 As any dedicated HDR photographer will tell you, you should be carrying a tripod with you at all times. Even if you are carrying your tripod, however, it’s not guaranteed that you will actually be able to use it. Many buildings prohibit tripod use and many security guards get all hot and bothered when anyone walks into their territory carrying one. Despite this (and I won’t get started on how annoying and pointless some of these situations can be in this post) you can often save the day if you are also carrying a small and pretty inexpensive piece of equipment. I have two Joby Gorillapods – an SLR-Zoom model and the larger, sturdier Gorillapod Focus . Frequently the same people who complain loudly if you even think of setting up a tripod won’t bat an eye if you pull out a Gorillapod and use that instead. The picture shown here was taken with my D90 on the Gorillapod SLR-Zoom in St. Patrick’s Cathedral, New York, a place where tripods are completely verboten. I had to remove the camera’s battery pack and restrict myself to a smallish lens (this was shot with the Sigma 10-20mm) since the SLR-Zoom model, from my experience at least, really isn’t sturdy enough for anything but the lightest body/lens combination. Regardless of only having this small tripod-replacement, I managed to get some great shots by clamping the bendy legs of the Gorillapod onto the top of one of the cathedral pews. In some places, the fact that you can attach the Gorillapod to posts, furniture, fences, etc. actually gives you better camera-positioning options than you would have with a traditional tripod. The newer Gorillapod Focus model is intended for larger cameras and can handle the weight of a pro-body with battery pack and a decent sized lens. For even more flexibility, add a small ball head to allow easier adjustment of the camera position. I have Joby’s own ballhead for the Focus and a small, generic ballhead on the SLR-Zoom. Next time you find yourself having to use your tripod as a walking stick because some officious security guard tells you you can’t use it, save the day by trying to use a “non-tripod” instead and see if you can get away with that. I expect you will be pleasantly surprised. Great ideas here Dave and thanks for posting. I have my gorilla pod attached to my portable camera so it is with me at all times. I’m gonna look into that focus. Sounds like a great thing to have in the ole bag! I was wondering about this, thanks for posting this article Dave, it was most informative! This is a great idea, I have been accosted by Security Police in Italy many times and just recently in San Diego! Picked this one up on your twitter feed. I found them fab in use mind u but gave up after my 3rd one. Somethings i use when a “tripod” aint gonna cut it. I use my mono stick, this is a walking stick that doubles up as a monopod, superb in some settings but not all. Its great for when your out walking as well. An old tripod mount with a bit of string attached to it with a large washer on the other end. I attach the mount end to the camera as usual and the washer goes on the floor my foot pops over it and i pull it tight. this steadies the camera pretty well if you put a bit of tension on it. John, I’ve had my SLR-Zoom for a couple of years and, thankfully, have had no trouble with it. My Focus is new so I’ll keep an eye open for any cracking on it. I like your other suggestions too but, for the kind of shots I’m taking (shutter speeds in the 1-10 second range in dimly lit interiors), I suspect they wouldn’t provide enough stability. For outdoor use in good light, though, they would likely be great (I used the “string and tripod screw” idea as a poor student before I could afford a real monopod 🙂 ). Yeah. Very useful. I looked at the Gorillapod and decided to buy a small tabletop tripod. That was a big mistake as it’s only good on flat surfaces. I do, or want to do, a lot of HDR, often pretty subtle, and am always running into issues with the tripod police. I’m going to pickup a Gorillapod which is what I should’ve done in the first place. Great idea, mate ! I need to check again the Gorilla’s. And amazing pic ! Nice tip Dave – could have helped a few weeks ago in St. Patrick’s while battling the tripod police! I probably gave the wrong impression here. I actually agree with St Patrick’s policy on tripods since the issue there is one of access. It’s always been really busy when I’ve visited and setting up tripods in the aisles will definitely get in the way (at least some of the time). Now over at the Rockefeller Center, it’s a totally different matter – no tripod use from the almost-empty viewing area on the roof? That’s just mean. I know that this is not always a great idea, but where possible, I take 2 small bean bags with me in my case. They are small enough not to get in the way, and they are easily used by sitting them on a stair rail, or ledge then your camera on top, but I have found that this is far better a method when using a remote shutter. Steve, bean bags are another great solution to the problem. Thanks for adding this. Thanks for the information and tips! I’ve been looking into gorillapods for awhile but wasn’t sure which to get. This is very helpful! Superb image and agree that a Gorilla can be of use, I used to use one of these for my compact but haven’t yet got around to a non tripod tripod – could be on the shopping list though and maybe quicker than cranking the full size kit down to floor level which I sometimes have to do.